Mixed class carriages were a throw-back to the days of the stage-coaches, where passengers paid different prices to sit indoors or outside. Variable fares were imposed by Parliament; the railways had to offer a choice of fares and conditions of comfort. Throughout the Victorian and early Twentieth Century periods, standards improved and by 1963 the last locomotive-hauled dual-class carriage was being built - our own 16267. No dual-class carriages were built in the MkII or MkIII build-types during the 1980s or 1990s. Today, most new trains are self-contained unit-types and it is unlikely that a traditional dual-class compartment type design will ever be made again. 16267 is the last of 1,267 of this type built between 1953 and 1963. They feature three compartments of second class accommodation ('standard' on today's mail-line railway), and four compartments of First class ('business' in modern-speak). Usually, First class passengers are given more leg room and their compartments are 18 inches wider. Deeper cushions, curtains, and extra reading lamps also feature. Carpets, magazine racks and more expensive veneers are also provided. The Second class is more modestly decorated in formica panels, simpler bench seats with shallower upholstery, fewer lights, and plain lino on the floor. On BR's different regions, they followed the earlier practices of the pre-nationalised companies in regard to the number of passengers per compartment. On the Midland and Eastern regions they expected six passengers per compartment and on the Western and Southern regions they tried eight per room, and did not provide arm-rests to make the point. 16267 was delivered new to the Scottish Region, part of the former East Coast organisation. Later transferred to the Eastern Region, it finished its days at Neville Hill depot, Leeds, and was withdrawn simply because new High Speed Train stock was introduced. When examined with a view to preservation, it was actually in service and our examiners had to wait for it to come back into the depot. The Sale Department at Derby had been notified it was for disposal, but the depot hadn't, and it was still in a train formation. 16267 was purchased especially for its historical 'last one built' significance, and superb condition at the time, by the LMS&BR Coach Fund. Delivered by rail to the SVR in March 1983, it ran for eighteen months in blue and grey InterCity colours, before being painted in Carmine and Cream of the 1950s batches of this type. 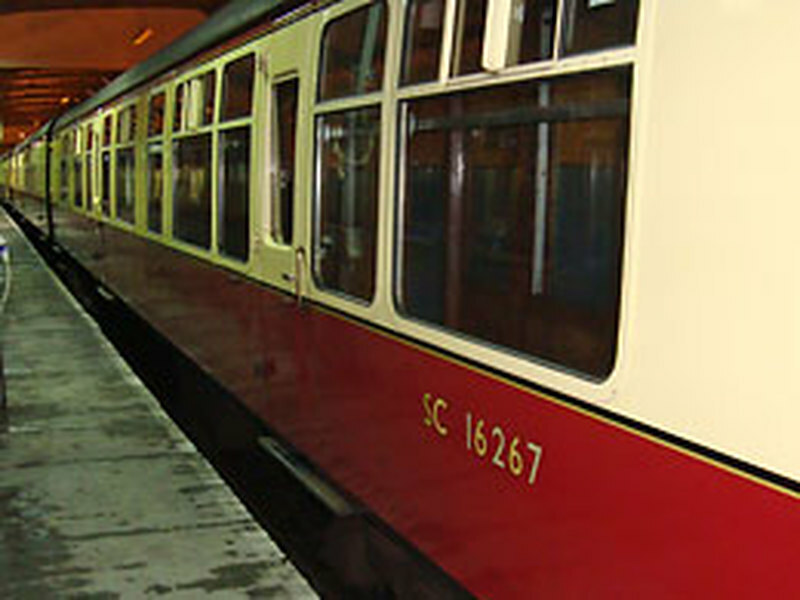 16267, when new, would have been turned out in the Maroon colours which batches after 1958 received. This coach rides on 'Commonwealth' bogies built for BR under license at Immingham. These are derived from American locomotive bodies developed by the Commonwealth Steel Corp on Pittsburgh. The coaches on these bogies were intended for 100mph running and are very smooth riding, even on the 25mph SVR. Reupholstered in both classes at SVR Carriage Works, Kidderminster, 16267 presents a very tidy example of this useful, comfortable design. One unusual feature of these coaches was the stretcher-window situated in the middle second class compartment. These allowed ambulance crews to load stretcher-borne patients into the train, and one of the best examples of this traffic was a weekly booking from London Paddington to Bristol Temple Meads, where patients were sent to convalesce near Yatton. This traffic was forced to use the M4 motorway after 1977 owing to withdrawal of the composites on that service, and no provision had been made in the replacement MkIII build.